When I think of PlayStation Vita ports, I usually think of PS3 or PS4 games that have been slightly dumbed down, maybe in terms of graphics, or maybe they’re missing some fun pieces of DLC (I’m looking at you Borderlands 2 and Resogun). While it only makes sense that the port is slightly lacking, considering it is being taken from a full-sized console and being jammed into a handheld one, it can still be annoying to find that the game you once thought looked so impressive on the PS3 now looks a little fuzzy on the Vita. On the flip side, however, it is always incredibly refreshing when a port actually looks magnificent on the PS Vita and includes a crazy amount of DLC, which is why I enjoyed my time with Atelier Ayesha Plus: The Alchemist of Dusk a great deal. The Alchemist of Dusk first came out for the PS3 back in 2013, marking the beginning to a new Atelier series. Although it only earned a 6/10 from PlayStation LifeStyle, it was popular enough to warrant a PS Vita port which only recently released this month. Unlike the core PS3 version, the port comes with most of the original’s extra DLC, including extra missions, costumes, and enemies. A couple of changes, such as a harder difficulty and the ability to easily swap out party members, were also added into the Vita version. The basics, such as the story, gameplay, and characters — those remained the same. The graphics, for the most part, also remained the same, with the characters, environments, and enemies looking clear and crisp. The detailed textures came at a bit of a cost, however, as the frame-rate drops occasionally, making certain areas feel very laggy and slow. The story begins with Ayesha, a budding alchemist who has decided to try to figure out what happened to her sister Nio, who disappeared a while back. Ayesha sees Nio as a strange, ghost-like apparition when visiting her grave one day, prompting her to begin her a long and perilous journey to discover clues on her sister’s whereabouts. During her journey, Ayesha manages to travel a number of unique environments, fight a whole bunch of monsters, and make several new friends along the way. While that sounds fairly standard of a RPG, the thing that really sets Ayesha apart from every other game is the alchemy system. 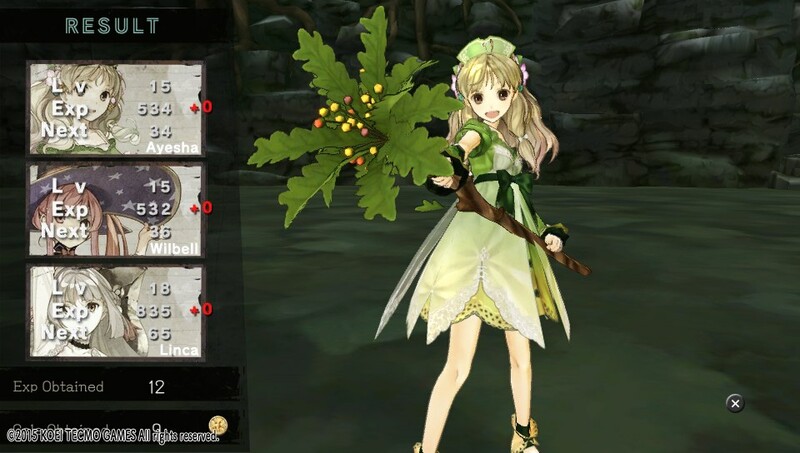 Because she is an alchemist, or as she likes to refer to herself — an “apothecary,” a large focus of the game is on the player’s ability to gather materials and make something unique out of them. There are potions to be brewed, bombs to be crafted, and various household items to be created, including detergents and gloves. To make such fascinating things, Ayesha must either buy materials from stores of collect them from various wilderness areas, being careful to either avoid or kill the monsters living there. Different materials can add different effects to potions, such as give a healing potion the ability to restore mana, which is used for magical attacks, or giving a bomb the ability to do different types of damage. Items crafted can be used in battle to damage enemies or heal party members, or can simply be used on the road to alleviate certain status effects. Crafted items also play a huge role in side-missions, which generally consist of someone wanting a certain thing made for them. There is a group of women asking for detergent, a strange man asking for an ice bomb, an elderly lady asking for a medical patch to heal her back, and so on. Fulfilling these requests is how Ayesha and her crew earns most of its money, and probably most of your time will be spent trying to gather materials to make these people what they want, however repetitive that may be. The rest of your time will probably be spent in combat or interacting with other characters. Combat is fairly standard — it is that same turn-based, party system that can be found in a number of other JRPGs. Each party can only consist of three people at a time (one of which has to be Ayesha), so choosing who to include in the party can be a little tricky. Do you want the witch Bell, who can cast a number of buffs and area attack spells, or would you rather have the warrior Linca, who calmly wields a massive sword that deals massive damage? In the end, you might choose Bell, because you might think she has more interesting things to say to the players. Characters talk a lot, by the way, so be prepared to either read lengthy pieces of usually meaningless dialogue or be prepared to mash the cross button to skip by it. You won’t be missing much if you do choose to skip it. Besides combat, side-missions, and crafting, the only other thing left to do in Ayesha is to wander around the overworld. Unfortunately, this aspect of the game is incredibly bland and barren. The overworld is essentially just a number of connected pit stops, each of which will bring Ayesha and her gang into a more open level area, where materials can be collected and monsters can be battled. Travelling to different pit stops takes up time, which plays a somewhat important role in The Alchemist of Dusk. Different things happen on different days and months, like the bazaar might come into town or a certain shop will be available. Travelling from one pit stop to another can take days, and even gathering materials can take up days. While I thought that was a fun idea, it did get somewhat annoying when I missed an event by a day or two because it took 10 days to get from one town to another town. In the end, though, I enjoyed my time with Atelier Ayesha Plus: The Alchemist of Dusk. From the fun, turn-based combat system to the deep crafting and alchemy system, The Alchemist of Dusk offers many hours of gameplay. Not only that, but the PS Vita version of the game looks surprisingly nice and has a lot of extra content, although that sometimes comes at the cost of the frame rate, which does drop significantly in certain areas. I recommend buying it if you are a fan of the Atelier series or a fan of JRPGs in general, but if you had it on the PS3, it might not be worth picking up again.